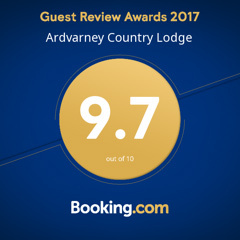 Owners Carin van Wing and Wilfred van Wing..
Ardvarney Country Lodge fully respects the rights of users of our website and is committed to protecting your privacy rights. We are committed to protecting and respecting your privacy and complying with our legal obligations in relation to the processing of personal data under the General Data Protection Regulation (GDPR) and Data Protection Acts 1988-2018. ACL will not collect any personal information (personal data) about you on this website without your permission and any information which you volunteer to ACL will be treated with standards of security and confidentiality. Personal data is not used to gather identifiable personal information on individual website visitors, except in so far as this is permitted by law and may be necessary in order to prevent or detect problems or offences in relation to the operation of the website. We collect personal data from you which you volunteer when you provide such personal data to us, or via our services with which you interact. We may also be given personal data relating to you by other partners such as Booking.com AirB&B and Tripadvisor during a booking . All other Data which you ask us to process on your behalf, or which is necessary for us to process for us to fulfil our role as providing accommodation. Provide you with booking inquiry answers, invoice and other requests made by you. We may use your data to send you information relating to our services, events and products which may be of interest to you. If you do not want us to use your data in this way, please notify us . We may process and collect personal data that you voluntarily provide us with through the ‘Contact Us’ form on our website. Our website is not intended for children and we do not knowingly collect data relating to children. Links to external websites: Any external links to other websites are clearly identifiable as such, and we are not responsible for the content or the privacy policies of these other websites. Any changes to this Privacy Statement will be posted on this website so that you are always aware of what information we collect, how we use it, and under what circumstances, if any, we disclose it. We therefore encourage you to periodically review this statement to be informed about how we are protecting your information. If at any time we decide to use personal data in a manner significantly different from that stated in this website Privacy Statement, or otherwise disclosed to you at the time it was collected, we will notify you by e-mail or in writing, and you will have a choice as to whether or not we use your information in the new manner.